It's been awhile since I've "devoured" a book this quickly, but what can I say? I do love a good mythology story and Magonia is one of the most creative stories I've read in awhile. 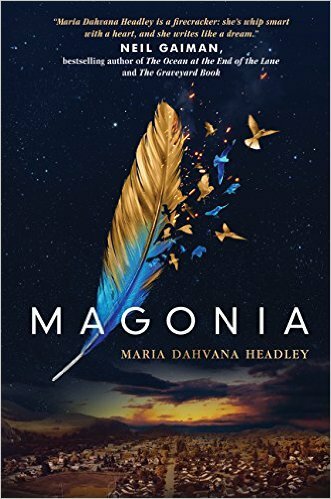 Inspired by real life historical manuscripts depicting a people who lived in the sky, Magonia follows the story of young Aza Ray Boyle, a teenager with a very unique illness: she is literally drowning in air. All her life, Aza Ray has been poked, prodded and frowned over by doctors who are stumped as to why she has such difficulty breathing. Her only respite from hospital rooms and tests? Her family and her best friend Jason, a slightly manic, but fiercely loyal, boy genius. On the eve of Aza's 16th birthday, 2 momentous things happen: Jason confesses his feelings for her and Aza dies. Yep. The main character "dies" in the first third of the book BUT only to be reborn as Aza Ray, long-lost daughter of Zal, captain of the Magonian air ship Amina Pennarum. Aboard this ship, Aza Ray learns about her past, the secret world of Magonia and the destiny she was born to. Along the way, she flies with squallwhales, battles deadly assassins, and befriends the Rostrae, a servant class of half-bird, half-human changelings. Right from page 1, author Maria Dhavana Headley immediately captures your imagination. She does an amazing job at world creating and bringing to life such a fantastical world as Magonia. I loved how she sets her readers' imaginations aflame imagining creatures who are both bird and human, plants that grow in mid-air and huge sailing ships powered by gentle giant bats. Although sometimes the plot of Magonia can be a little predictable, such as the setting up of the inevitable love triangle (it is technically a YA novel after all), I still found it thoroughly entertaining and the ending left me wanting more. Thankfully the next novel in the series is supposed to come out this fall!